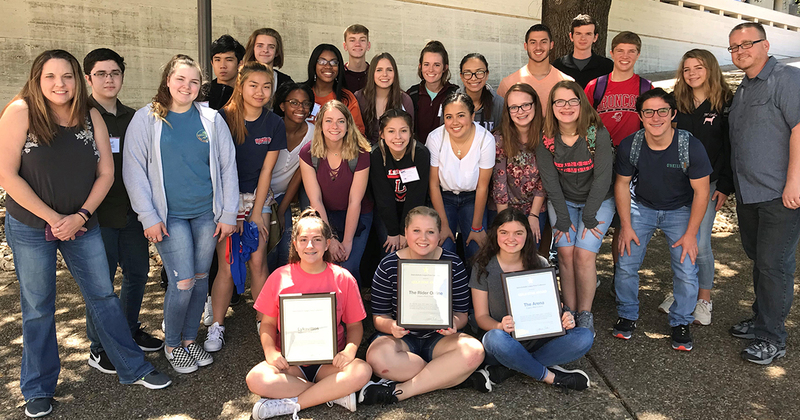 The two journalism teams won awards at ILPC in May. Legacy High School and Timberview High School have been awarded a number of medals and distinctions from the state and national level for their publications. Legacy High School's newspaper, Rider Online, won the National Scholastic Press Association (NSPA) Pacemaker award. The Pacemaker is NSPA’s preeminent award for scholastic journalism. Rider Online also received the NSPA Best of Show. The school’s yearbook, The Arena, was a finalist for the Pacemaker award. At the state level, Legacy High School’s yearbook and newspaper won a gold star at the Interscholastic League Press Conference (ILPC). The two publications also received 30 individual awards at the spring competition. Timberview High School’s yearbook earned a gold medal and an individual award from the Columbia Scholastic Press Association (CSPA). In addition, the Timberview High students earned an NSPA All-American ranking with five marks of distinction. Their state accomplishments include winning a silver star and a Distinguished Merit Yearbook award from ILPC. The journalism students also won 10 individual awards at the state competition. The MISD journalism advisors also received accolades for their contributions. Legacy High School’s Leland Mallett was named Journalism Education Association's National Distinguished Adviser of the Year. Rachel Dearinger, also from Legacy High, received the Edith Fox King Award from ILPC.